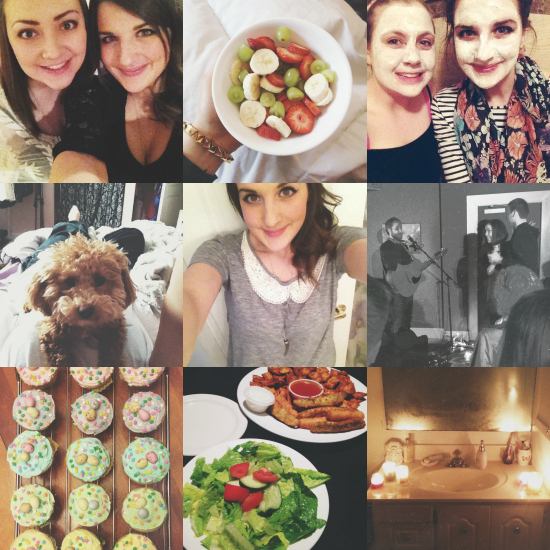 Looking back, April was actually a pretty busy/ hectic/ stressful month! I had important life decisions to make, work was insanely stressful, I probably had 4 days off all month (and lots of 12 hour days which no longer excite me), and I tried streching myself way too thin. I've tried to maintain a social life all month which has meant very little down time, me time, blog time, or taking care of myself. So hopefully I get a handle on that next month LULZ. On the bright side, I've spent lots and lots of time with all sorts of lovely friends and family this month! My bestie Laura turned 23 and I panicked more about her age than she did. Amanda and I had a lovely cliche girls night and she helped me with my stress overload! What would a monthly snapshot collage be without a cute photo of Maya? I dug out some of my favourite old pieces just in time for the Spring weather! Mike and I went to an amazing Craig Cardiff show at Cafe Natura! Then met up with Josh and Laur for a trip to the Casino. We also all made delicious Easter cupcakes together! NOM NOM. So many fun times this month with those two guyz. Mike and I had an awesome staycation together, which was a lovely way to end the month! With very little time to myself, showers and baths have become some of my only essential relaxation time. I am pathetic.